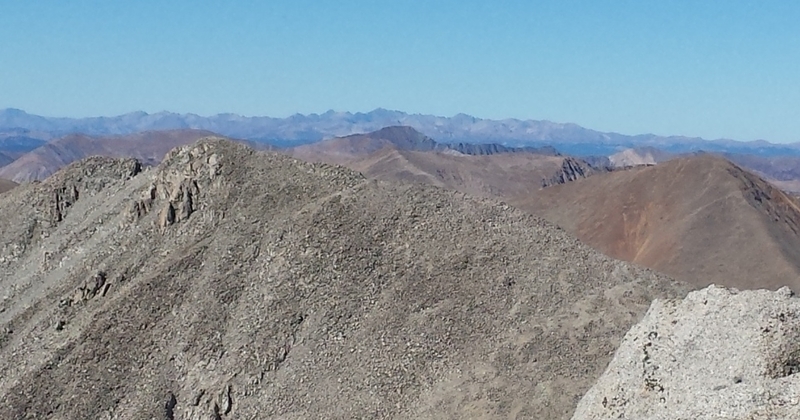 This was a beautiful Fall hike and my 9th fourteener summit. I left Colorado Springs early in the morning, drove 2 1/2 hours to the trailhead near Salida, hiked 7 1/2 hours, and drove home that evening. It made for a long day. I’m not sure what got into me, in order to do that trip all in one day. Driving home in the dark was unpleasant, due to the bug-splattered windshield and stress of watching for wildlife along the road. One advantage of a Fall mountain hike is the weather: not a cloud in the sky all day, and no threat of afternoon thunderstorms, as is usual in the Summer. The temperatures were mild. Disadvantages of Fall hiking include fewer hours of daylight, no water in the streams, and very few wildflowers. Aspen leaves were still at about 25% color. My goal was to reach the summits of both Mt. 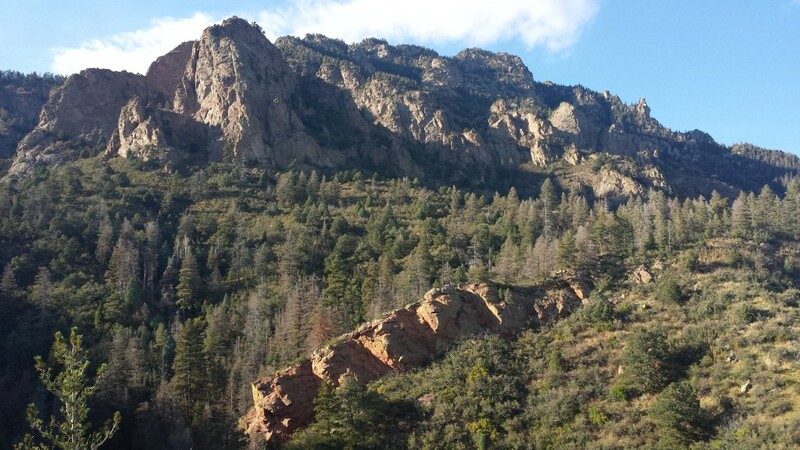 Shavano and nearby Tabeguache Peak. However, my legs tired out sooner than expected so I only did the one summit. A highlight was encountering a group of female and juvenile bighorn sheep at the saddle below the Mt. Shavano summit. Cheyenne Mountain State Park is a relatively new park, opened to the public only since 2006. This was my first visit. The trails seem popular with mountain bikers. No dogs are allowed. It was interesting to view Cheyenne Mountain from a different perspective. 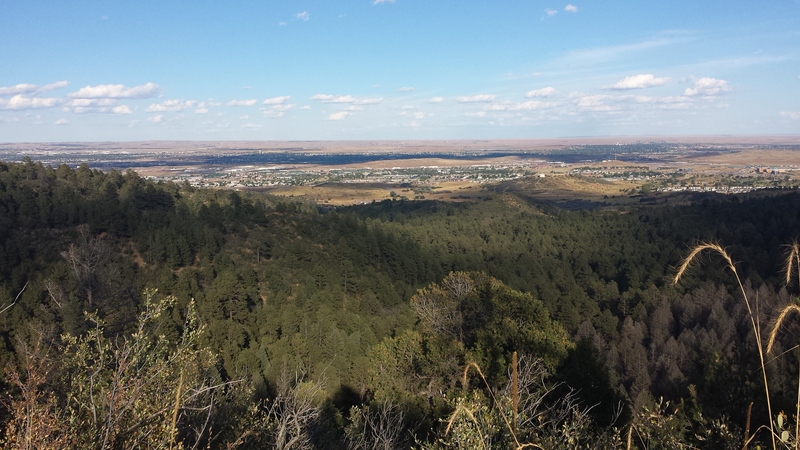 Fort Carson dominates the views to the East. Sounds from the Fort Carson public address system and Highway 115 traffic echo off the mountain and are audible in the park. This article in the Gazette states that a new Dixon Trail is being built largely by volunteers from the top of N. Talon trail in Cheyenne Mountain State Park to the summit of Cheyenne Mountain. The latest estimate for summit trail completion is 2019. 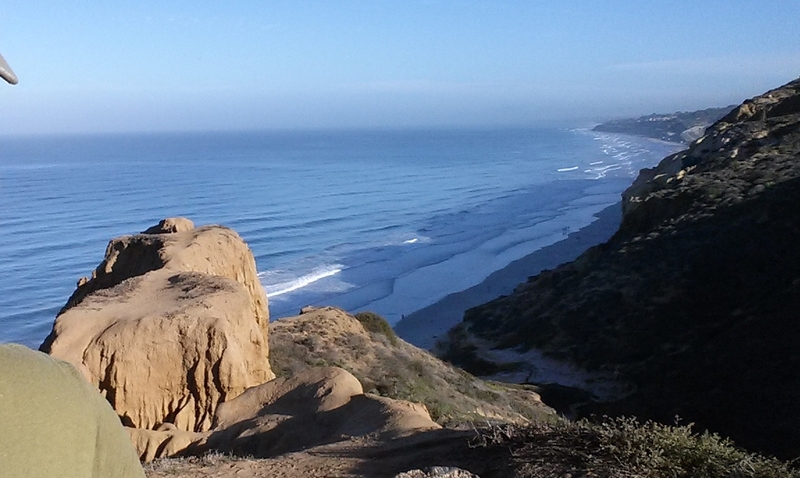 During a visit to San Diego, California for a job interview, I had some free time and hiked in Torrey Pines State Natural Reserve. As far as I can tell, “State Natural Reserve” is the California term for what we in Colorado would call a State Park. There is no fee for park visitors on foot. 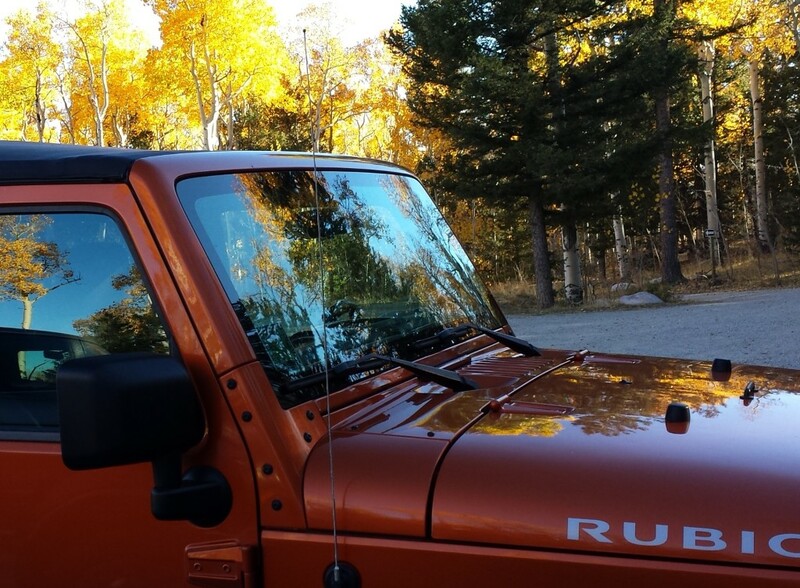 Fees apply if bringing a vehicle into the park. I found free parking along the beach just outside the entrance to the park, so I had no fee. My hiking route started along the beach. Then, I took the Beach trail up into the park. I made a loop of Beach trail, Razor Point trail, Torrey Pines Park Road, and Broken Hill trail (north fork) back to the beach. I’d recommend this park for anyone with some time to spare in San Diego!